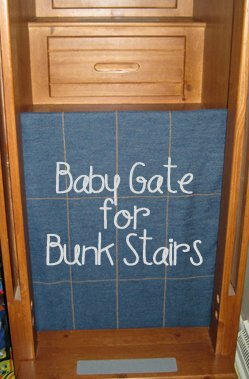 I thought that you might like an update on how our bunk bed baby gate was working. First, to be honest, Baby E is now 3 years old. Since his dad is 6 foot 7 inches tall, you won’t be surprised to hear that Baby E is also tall – more like a 4 year old. Does it still work for him? Not really. He can just climb over it if he really wants. If I remember correctly, he figured out the whole climbing part sometime this past summer. The good news is that he’s capable of climbing down the stairs with ease and he doesn’t seem to go up there at night to bother his brother – knock on wood. 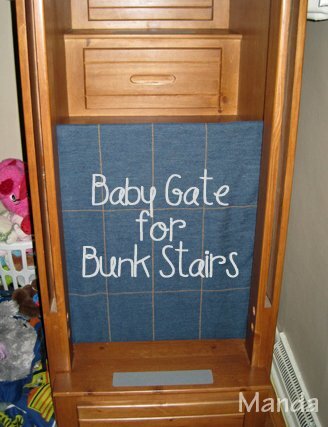 We have found another great use for our baby gate. It’s now a puppy gate for our bunk bed. When you have a puppy you are often worried about accidents and excessive puppy chewing. I didn’t want Maizey getting up there and getting into trouble. So yes, we still use our bunk bed gate, but it’s mostly to keep our puppy from getting up there. It’s still in great condition and fits snugly in place. I’m so happy that it’s worked for us for so long. I totally got my money’s worth. What!? My Baby is a Toddler?